Work by Surge, Gaia, Stormie, Remi/Rough and others at The Underbelly Project in New York City. Photo by RJ Rushmore. One of the strangest projects ever undertaken by a group of street artists is The Underbelly Project. It’s an example of what happens when some of the world’s most talented street artists want to make art for themselves rather than for fans or for fame, although the organizers subsequently commercialized the project to a small extent to fund future iterations. 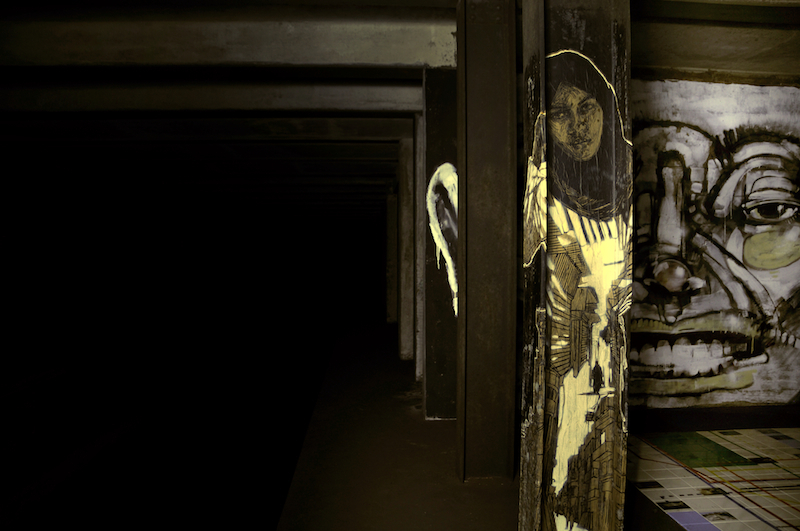 The Underbelly Project was organized and executed in 2009-2010 by two street artists, Workhorse and PAC, who facilitated the installation of artwork by over 100 artists in an abandoned and half-built subway station underneath New York City. The project was kept a secret for the year or so that the installation was taking place. To install the work, the organizers brought down artists one or two at a time and gave them one night to paint. Throughout the installation, the organizers meticulously photographed the artists at work. Eventually a handful of outside photographers were allowed to photograph the finished pieces. All was finally revealed publicly on Halloween 2010 with articles in The New York Times and other major newspapers around the world. Within hours of The Underbelly Project’s article in The New York Times, the location of the project was uncovered by urban explorers and revealed publicly online. Well before The New York Times article appeared, much of the project was painted over or otherwise destroyed by explorers who had found the site before the announcement. Unaware of the destruction, people reading the Times article tried to visit The Underbelly Project. Police soon set up watch and arrested news crews and other curious visitors trying to see the work for themselves. About a year after the project was first announced, Rizzoli published the official book documenting The Underbelly Project, a pop-up show was held in Miami featuring the work of some of the Underbelly artists, and the team that organized the project in New York did a smaller-scale Underbelly Project in Paris. Now my questions are: What does the project mean for street art? What role did the internet play in the development and promotion of The Underbelly Project? The second one is the easier of the two questions to answer. Despite strong print media coverage, the popularity of The Underbelly Project — and particularly its sustained popularity over the years — has been largely due to the online distributions of photos and stories about the event. While the project’s website is basically a dormant placeholder, Workhorse and PAC made sure that others shared their story. With 167,000 hits on Google for “The Underbelly Project” as of October 2013, it is clear that word got out despite few people having seen the project in person. Although Vandalog is far from being the most highly-trafficked site to cover The Underbelly Project traffic statistics for Vandalog show that the site has received over 20,000 page views on stories related to The Underbelly Project in the first two years after it was announced. I’m sure that’s just a drop in the bucket compared to the slideshow about the project on The New York Times’ website, but it’s also a boatload more than I ever could have reached even if I had been telling every person I met about going down to see the project. In the days before the internet, the project might have quickly faded into obscurity even with an article in The New York Times. After all, yesterday’s newspapers are just paper for dogs to piss on. Thanks to the internet, documentation of The Underbelly Project spread around the world with speed and persistence. The Underbelly Project is not entirely unique. Workhorse argues that similar events occurred 15 years ago, but without the same high-quality documentation, and to that, I would add distribution as well. Workhorse notes that LA’s Belmont Tunnel would get painted every night and there were wild parties held in abandoned underground locations in Baltimore, but neither of these got the same attention as The Underbelly Project. If someone at those parties had posted photos to Instagram, we might be talking about those events rather than The Underbelly Project. The internet also helped to solve a major problem that Workhorse and PAC faced: anonymous distribution. Workhorse wonders, “How do you simultaneously tell everyone about it, yet not talk at all?” Their answer was to create a barebones website and spread the word through proxies such as The New York Times, Vandalog, Katherine Lorimer aka Luna Park, Ian Cox and the other artisted who participated. Workhorse and PAC have very rarely spoken about the project in interviews, but they have allowed others to tell their stories and speculate about The Underbelly Project for them, with much of that discussion happening online. In addition, Workhorse and PAC use their limited website and occasional newsletter to communicate directly with tens of thousands of people. The internet has allowed Workhorse and PAC to run The Underbelly Project with the anonymity they want, while not keeping it a complete secret. It’s more difficult to determine what The Underbelly Project means for street art and how it is related to street art or not. In the context of a community of street art blogs that are generally supportive boosters, even such a mild critique is surprising. Yet, Macdonald is not entirely off the mark. As I’ve written before, I agree that The Underbelly Project fails miserably on several traditional street art measures. But people heard about the project and they saw the work. It’s likely that The Underbelly Project was seen by more people than if the same artists had painted equivalent work at ground level directly above where The Underbelly Project took place, and the underground nature of the project added an allure that street level murals don’t have. When people with no connection to art hear that I’m interested in street art, they usually mention Banksy, Shepard Fairey’s Obama posters, David Choe’s Facebook millions, or The Underbelly Project. And when they bring up The Underbelly Project, it’s always in a positive light. They enjoyed looking at photographs of stunning artwork online or on the front page of The New York Times. The project’s mystery grabbed their attention and has stayed with them for years. In this way, it was successful in achieving the goal of many street artists: People were exposed in an unorthodox fashion to art installed without anybody’s permission. While there were the gatekeepers involved in the announcement (the newspapers and blogs), Workhorse and PAC could have simply posted their own photos to Flickr instead. Criticism of The Underbelly Project brings to light a major disconnect among some street art fans. 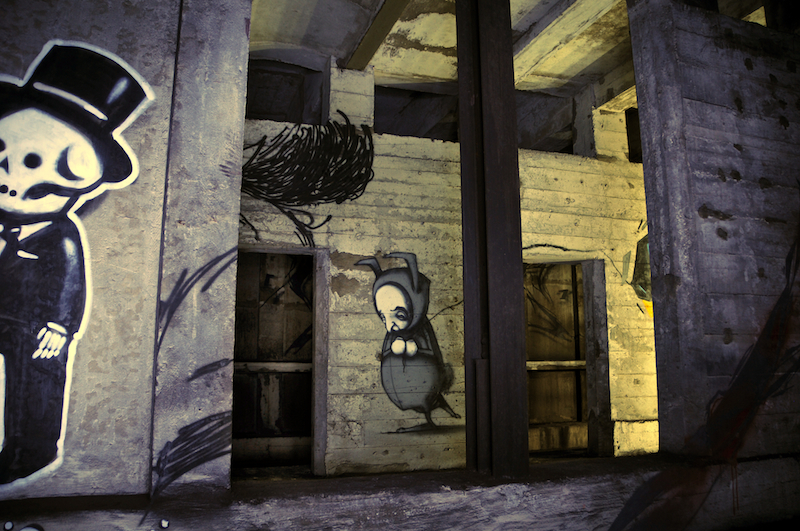 On the one hand, fans are excited to see that Phlegm has painted a new work in an abandoned factory that only a handful of adventurous people will ever see in person. But many of those same fans are upset that The Underbelly Project is not available for everyone to visit. Whereas Phlegm will take a few photos of his hard-to-find work and post them online without addressing the issue of the work’s physical accessibility, Workhorse and PAC made a conscious effort to let people know about The Underbelly Project while emphasizing it would probably be dangerous to visit it in person. For Workhorse and PAC, the project is not about street art or making the city look better; it is about doing something cool and adventurous. And, as they pointed out, if you do something cool, you generally want to tell people about it. Workhorse also pointed out that graffiti writers have taken photos of their work for decades simply as a way to remember those moments. But while those photos were originally traded between other writers at a writers’ bench, Workhorse and PAC coupled that same motivation with the means to give the entire world access to their photos. 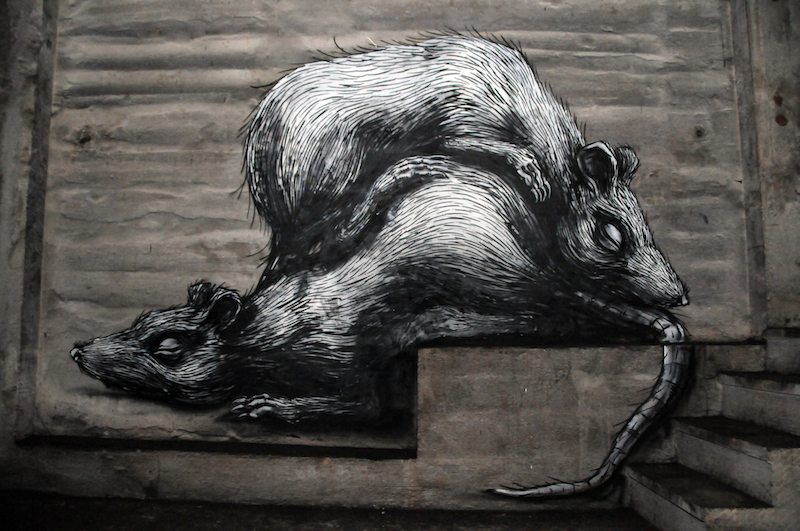 Work by Roa at The Underbelly Project in New York City. Photo by RJ Rushmore. If The Underbelly Project is not another street art project, why was it treated like one? Perhaps it’s just because many of the artists involved are connected to street art or graffiti. But it may be more than that. The photos of Roa’s work in The Underbelly Project are not substantially different from photos that Roa takes of his work in abandoned factories in Belgium. And the means of distribution are the same. Roa’s Belgian work might not appear in The New York Times, but those photographs will appear alongside Underbelly photos in the same independent and social media outlets. A viewer who doesn’t know better might assume the photos were taken in the same location. To the average online viewer, or even someone reading The New York Times in print, the difference between photos of Roa’s Underbelly piece and a piece in Belgium is inconsequential. They are never going to see either piece in person. The difference is that The Underbelly Project is a more extreme example of what the internet has done for street art. It initially seems to be exclusive because the physical space is a restricted location, but photographs of the project spread worldwide and had greater reach than works in more accessible public locations. The Underbelly Project is a case where geography and physical access no longer matter. Only the documentation and the distribution of that documentation matter. While most fans accept this approach when the art being documented and distributed is more clearly street art, it’s less acceptable for work that is less accessible. Suddenly, some people see the process as distasteful and inauthentic. And if it is, then so be it, but then it’s not just The Underbelly Project at fault. Any street artist who submits photographs of their work to a blog or maintains a social media presence would be at fault too. One thing The Underbelly Project accomplished that a lot of street art aims for but falls short of achieving is to enter the realm of folklore. There are only a handful of instances over the last thirty or so years where street art and graffiti projects have left such a mark. These are the projects that force people to think differently and consider their surroundings in a new way whether they witnessed the projects in person or not. A few standout examples include the Miss Rockaway Armada, Chris Pape aka Freedom’s Freedom Tunnel, Improv Everywhere’s Frozen Grand Central and No Pants Subway Ride, Philippe Petit crossing the World Trade Center twin towers by highwire, Charles Simonds’ Dwellings and Fairey’s OBEY Giant campaign. Swoon wheatpaste in the foreground at The Underbelly Project in New York City. Photo by RJ Rushmore. “I was standing on a street corner in St. Louis yesterday, and someone said to me, “Did you hear about that thing that happened where there is a time capsule under New York City, and all of this amazing art is entombed there forever and no one knows where it is?” I happened to be standing next to one of the rascals who organized said miraculous event right as those words floated through the air into my ears, and all I could do was kick him a little and laugh. What I loved about this moment was how quickly the thing had been distilled into legend, how accessible the beauty and strangeness of such an endeavor was to people who were only just hearing about it. It became a perfect silver strand plucked from the atmosphere, lovely as the sound of bells reaching you from off in the distance. No fuss, no muss, just a little pearl under the dark sea. The Underbelly Project might not be a mural on a wall, but for so many it has had a greater impact and spurred them to think more magically (to borrow from Curry again) about the city. Projects like Petit’s crossing of the twin towers and Simonds’ Dwellings were able to enter the popular imagination without internet promotion, but The Underbelly Project needed the internet, or at least the internet helped things a lot. With photos hinting at the project, the project’s legend was able to develop. That legend has since reached millions of people and inspired them to think about the possibilities of cities and the human spirit – as so much street art tries to do – and The Underbelly Project did it better than just about any legal mural I’ve ever seen. 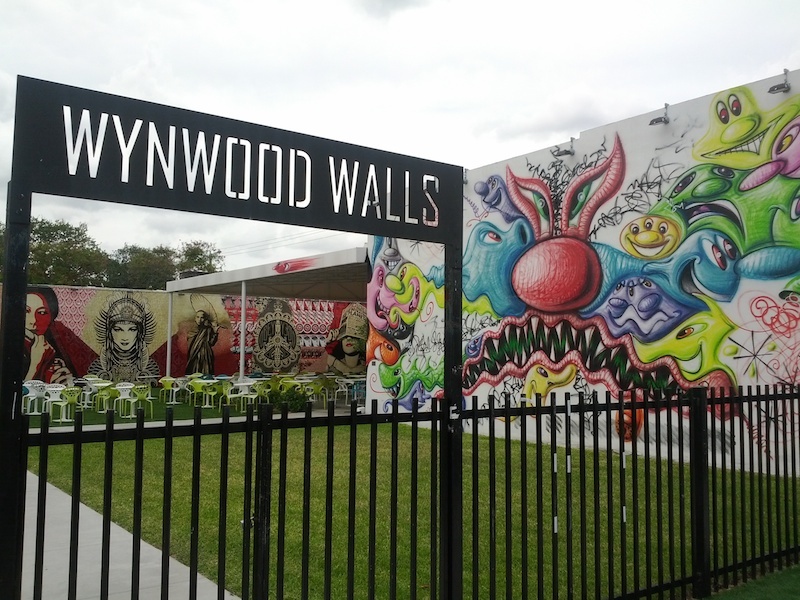 The entrance to Wynwood Walls in Wynwood, Miami with work by Kenny Scharf inside. Photo by Joe Anzalone. It was essential to this particular myth that the project happened where nobody could see it. Many other projects that became myths only took place for a short period of time. If you didn’t see the Miss Rockaway Armada when it visited your town, you missed it. If you didn’t see The Underbelly Project, you missed it. All you have are the myths and the documentation, which are different experiences from the “real thing.” There are no myths about Wynwood Walls. It’s a gated park in Miami that you can visit anytime. Even though I argue that location doesn’t matter with street art the same way once did, context still matters.